At Abwiz Bio, we have developed and optimized a 3-stage antibody affinity maturation platform that involves three separate library construction and selection/screening steps. After each screening step, engineered clones are combined for subsequent library construction. The use of six separate CDR-targeted libraries in Stage 1 allows us to explore maximal sequence space. Screening and sequencing the top engineered clones at each stage allows us to monitor the progress and provides helpful information that can aid in subsequent library design. As the starting affinity and sequence of each antibody and the nature of antigen are different for each project, it is difficult to predict beforehand whether the first stage of affinity maturation is satisfactory, or if the second and the third stages of affinity maturation are necessary. Therefore, at the end of each stage, we present our completed work and have an open discussion with each client to ensure they are satisfied and establish the subsequent steps of the project. Our team has decades of collective experience in designing synthetic libraries for phage-based selection. Abwiz Bio has led multiple successful affinity maturation campaigns, producing >10-fold affinity improvement for human, mouse, and rabbit antibodies with low nanomolar starting affinity. We have developed and validated a robust affinity maturation protocol that begins with separately targeting each of the six CDRs for mutagenesis. Our multi-stage approach covers more diversity and yields higher affinity clones that cannot be achieved by traditional methods such as CDR walking. The complementarity determining regions (CDRs) of an antibody form the majority of the binding surface with an antigen. 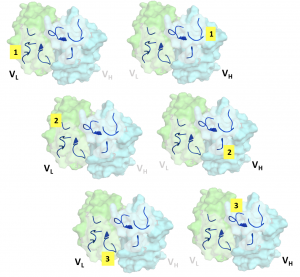 The CDRs comprise three loops that extend from both the heavy (CDR H1, H2, and H3) and light (CDR L1, L2, and L3) chains within the variable regions of each antibody arm. Affinity can be improved by targeting these regions for mutagenesis. However, the biological constraints of phage display (limits on maximal E. coli transformation efficiency) restrict the total number of possible variants within a given library to ~1E+10. (Much larger library size compared to yeast display, with a maximum of ~1E+08). Randomization of a stretch of six amino acids to all possible variants creates a theoretical diversity of 1.07E+09; thus theoretical diversity can exponentially exceed the practical library diversity. By targeting each CDR in a separate library, antigen interaction can be optimized for each individual loop in Stage 1. For each CDR, a bioinformatic approach is used to choose amino acids assumed to be sub-optimal for antigen binding. By comparing your sequence to antibody germline and structural databases, we can infer which positions may already be optimized for antigen binding and which can tolerate mutation. Our own experience with past successful campaigns for human and mouse therapeutic lead candidates also informs our choices. We constrain the total library size to the theoretical diversity limit while both avoiding mutations that would disrupt global antibody stability and maximally sampling the sequence landscape. CDR H1 and H2 sequences for antigen-binding clones are shown in sequence logo format. Notably, (1) Only designed amino acids are found at each position targeted for mutagenesis, (2) Stage 2 clones have stronger sequence convergence compared to Stage 1, and (3) High diversity is present in the affinity-matured pool. Phage selection is extremely versatile and can be tailored to obtain the desired antigen specificity or affinity parameters. Options include (1) competition with negative control antigen for negative selection against cross-reactive binders, (2) stringent selections by coating antigen at lower concentrations and/or by changing incubation and washing times for off-rate based kinetic selection, (3) antigen conformation specific selection compatible with both recombinant and cell-based antigens, and finally (4) the phage virus is stable to 80°C, allowing for selection of thermostable, highly-expressed clones. Our proprietary vector is compatible with both Fab-phage and soluble Fab production, allowing for rapid screening after phage panning. After selection, hundreds of randomly picked clones are produced and screened as soluble Fab from bacterial supernatant. Screening lead candidates in high-throughput saves significant time and resources before proceeding to the expensive, time consuming IgG production stage. In addition to full sequence analysis, Fabs can be screened in high-throughput against recombinant or cell-based protein by ELISA, flow cytometry, functional assays, and SPR. Our 3-stage engineering strategy was used to improve affinity for an antibody lead candidate that recognized a high-profile cancer target. The sequencing analysis of the engineered clones identified at each stage provides strong support of our 3-stage strategy. The number of unique CDRs identified during screening is shown below. (# of unique CDRs)/(total # of CDRs) shows the sequence diversity of the selected clones for each CDR at each screening stage. The number of unique CDRs identified in previous selection rounds is shown below. This shows the number of clones that possessed a CDR sequence previously identified in Stage 1 (or in Stages 1 and 2). Unique CDR sequences were were consistently identified during the screening step at each stage. A traditional CDR walking protocol (choosing the best CDR clone from a single library before proceeding to engineer the next CDR), instead of using our approach to combine the entire pre-selected CDR pool for additional library selection, would have failed to identify the best candidate. These data provide strong support for our 3-stage engineering strategy. In one client project, we successfully improved affinity 10-fold to pM KD binding while simultaneously increasing the functionality of a therapeutic lead candidate. A 2-stage approach (single CDR → combined H+L library) was used, and a patent was filed on the sequence of the best engineered clone prior to further clinical studies. Engineered Fabs have slower off-rates compared to parental wild-type, demonstrating improved affinity by SPR assay. In another client project, we improved affinity 10-100 fold by using an exhaustive 3-stage approach (single CDR → separate H+L → combined H+L libraries). We provided 23 engineered candidates to our client for IgG functional screening, each with a unique sequence and substantially improved affinity. The top clones from Fab screening, performed after each engineering stage, are shown above. Stage 1 clones show higher affinity than wild-type, but still retain faster off-rates. Slower off-rates were obtained from Stage 2 libraries. The best clones, with saturated binding and very slow off-rates, were only obtained after Stage 3 engineering. Sufficient improvement in affinity can be identified after only Stage 1 engineering (single CDR libraries) or Stage 2 (heavy or light chain only libraries). In one project, our client was satisfied with the results after Stage 2. Our flexible platform includes Fab characterization after each engineering stage, enabling our clients to save time and resources by assessing the project outcomes at multiple points. This allows us to quickly provide results and to adapt our engineering approach as needed. Stage 2 clones were tested against parental wild-type Fab and the best Stage 1 engineered clones in off-rate ELISA. The mutations selected from Stage 2 libraries improved affinity substantially. All we require to get started designing your libraries is the amino acid sequence of your antibody. The antibody genes and the oligos used in library construction are synthesized as the first step, and Stage 1 engineering is typically completed approximately 2 months after gene synthesis. Stages 2 and 3 can each be completed in only 4-6 weeks, since they can proceed immediately with the library synthesis step. Because each project is unique, we work closely with each client at the beginning of every stage to carefully review prior screening data and to develop a solid plan.